We are pleased to announce the release of CREATe’s latest Working Paper, the twenty-eighth release in the series. 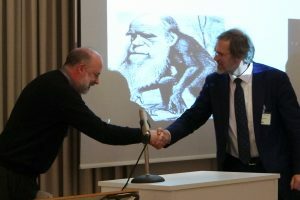 Monkeying Around with Copyright – Animals, AIs and Authorship in Law by David Komuves, Jesus Niebla Zatarain, Burkhard Schafer and Laurence Diver considers how advances in artificial intelligence have changed the ways in which computers create “original” work. It reflects on how analogies that may have worked sufficiently well in the past, when the technology had few if any commercially viable applications, are now reaching the limit of their usefulness. It presents a radical thought experiment in relation to computer generated art, challenging the legal responses to computer generated works and discussing their similarity to works by animals. 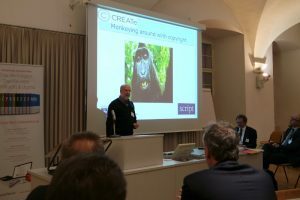 The paper was originally presented at the Internationales Rechtsinformatik Symposion (IRIS), held in Salzburg between the 26th and 28th February. There it had the distinction of winning third place in the LexisNexis best paper award. For CREATe, and co-author Professor Burkhard Schafer, this offers a pleasing symmetry. Schafer’s first CREATe Working Paper, “CCTV sniffing”: Copyright and Data Protection Implications, is a modified version of a paper that won the same award when the conference was held in 2013. On that occasion Schafer’s co-authors were fellow CREATe investigators Smita Kheria, Daithi Mac Sithigh and Judith Rauhofer. Fast forward two years and his prize winning co-authors are a CREATe research assistant and two CREATe PhD students, a fact that demonstrates the success of CREATe’s capacity building efforts. A suitably delighted Schafer said “for a group of researchers this young to get nominated for this prestigious award is testimony of the quality of our postgraduate students and the excellent support they get in Edinburgh to make the transition to academic careers”. This entry was posted in News, Working Papers. Bookmark the permalink.